I like the feeling I have after completing a batch of minis. 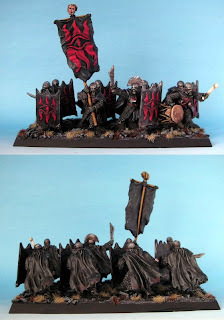 It's always nice to see a solid amount painted up and completed with themed bases. 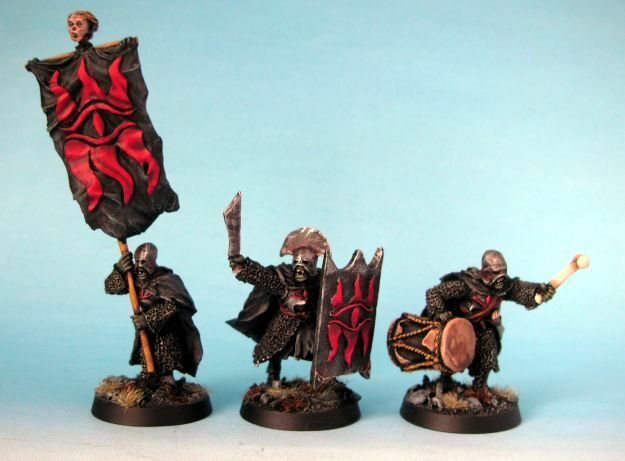 Today I finished painting the Black Guard of Barad Dur. These minis are not too demanding as far as painting is concerned but still I took me a few evenings to finish them off. I chose the 'official' GW colour scheme as I kind of liked it. However, I went for slightly darker tones so that the eye symbol on the shields would stand in contrast with the armour. Anyway, here they are, together with a movement tray. A close-up on the command group. Thanks for the comment, much appreciated. I started the bases by putting using Modelling Sand in three different sizes (so that the surface is more irregular). Then I gave everything a black undercoat and drybrushed the following colours: Adeptus Battlegrey, Codex Grey and finally Astronomican Grey. Each Time I tried to make sure that the previous layer shows and the final drybrush was done very gently so that the paint was left only on the edges. To finish it off I used two different types of static grass (Gale Force 9 Static Grass: Winter / Dead and something that looks like GW Citadel Burnt Grass. I think that these two work together pretty well. Arid Static Grass is not the other one. 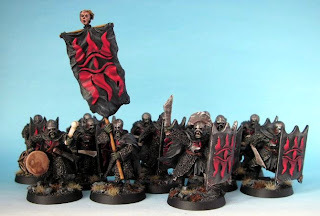 I bought the darker static grass in a local hobby store and it's a 'no-name' product ;) But from what I can see the Burnt Grass available at GW store seems very similar. I use medium and Rocky Basing Grit. I also have Fine Grit but regular sand works equally well. In my opinion Gale Force 9 offers top notch quality products, I have about a dozen of their Hobby Scenics. So I do recommend buying them (and I don't work for GF9 ;). If you have more questions feel free to ask, I'll try to answer as soon as I can. But, most of all I like bases and movement tray, especially grass and stones. Maybe, I'll try your recipe next time. Can't wait for the next works! Very nice job, I'm not a huge fan of these particular Orcs, a bit too pricey. But the job you did has given me second thoughts about buying these.